Head lice. As a parent, those words are enough to make your skin crawl (no pun intended). If you’re anything like me, you probably have at least one childhood head lice memory. And chances are, getting rid of them is not a nice memory. I have a very clear memory of myself sitting on a chair in our courtyard of the terrace we lived in in Chippendale in inner Sydney. My mum is painstakingly shampooing my hair with a disgusting smelling substance and my hair ended up so matted that it literally took hours to comb it out with that fine-toothed comb. It hurt. A LOT. And I have very fine hair. If your hair is curly? I can’t even imagine. So my daughter getting head lice is something I have been dreading. To my surprise, however, things have improved in that department. Significantly. Head lice lay their eggs (which are known as nits) on the hair about 1.5 cm from the scalp. Each louse can live for approximately five weeks, and females can lay up to 120 eggs during their short lifetime. The life cycle of head lice begins with eggs being laid, hatching, maturation into adults, mating and egg laying after which the parent head lice die. These eggs will hatch in six to ten days continuing the life cycle until the infestation is treated and the cycle is broken. 1) Pesticides – regardless of them being natural or synthetically derived, they dehydrate or suffocate the head lice and nits. This is the most popular technique available. 2) Wet combing – removing the head lice and eggs from the hair through combing them out with a conditioner or lubricant style product and fine-toothed comb. 3) Hairdressers – which specialise in the treatment and removal of head lice; typically a conjunction of both methods above. The key to treatment and eradication of a head lice infestation is to break their life cycle. This is why more than one treatment is necessary. It is difficult to kill all the eggs present when the infestation is first treated. Personally, I rely on MOOV Head Lice products. Not only are they made by Ego which is a brand I have been using for many years and trust, but they make the process very easy. It’s also Australian owned, and a few of the products have a lovely eucalyptus scent which my daughter and I really love. defend hair from future head lice outbreaks. I like to use a MOOV product at each step to ensure that the head lice are well and truly GONE. But the treatment products can be used on their own too. To kill the head lice and nits, use one of the below three products. MOOV Head Lice Solution and MOOV Head Lice Shampoo are clinically proven to kill head lice.. Treatments should be applied three times on day 0, day 7, and day 14. This ensures the head lice life cycle is completely broken. MOOV Head Lice Solution kills both the head lice and their eggs, breaking the head lice life cycle, with a 10 minute treatment time. When using the Solution, hair should be shampooed as normal after rinsing it out. 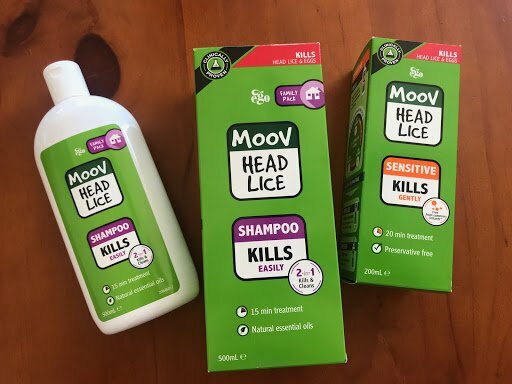 MOOV Head Lice Shampoo is my favourite product option in this range. It is an easy to use, effective head lice treatment. Simply apply to dry hair, cover with a reusable shower cap, leave for 15 minutes, and then rinse out like a normal shampoo. There is also no need to shampoo hair after treatment. 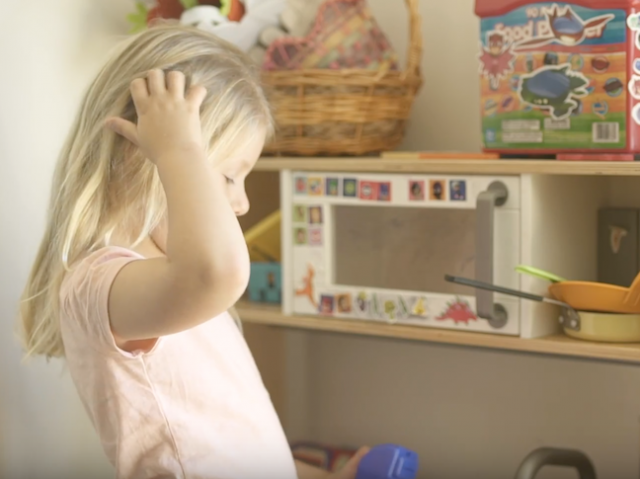 For sensitive (and younger – from 6 months of age) scalps, there is also the MOOV Head Lice Sensitive option which is free from fragrance, colour & alcohol and has a 20 minute treatment time. Be sure to repeat these treatments at day 7 and 14. MOOV Head Lice Combing Conditioner and MOOV Head Lice Removal Comb can be used either to detect or remove head lice, as a mechanical treatment on its own to remove live head lice, or to remove head lice and their eggs after using MOOV Head Lice Solution or Shampoo (my preference). The conditioner is simply added to wet or dry hair, the hair is then segmented, and then combed out using the MOOV Head Lice Removal Comb. It is important to ensure the comb is rinsed between each comb through. Lastly, there is also MOOV Head Lice Defence Spray. The Defence Spray can be sprayed onto children’s hair daily to help defend against head lice over an eight hour period. This makes it perfect to help ensure protection throughout the school day. It not only acts as a deterrent to head lice but acts as a leave in conditioner too. If you have a head lice infestation in the house it’s also best to do a thorough check of all family members (pets excluded) and treat as needed. It is also advised to contact the parents of friends whom your child has had close contact with so they can get on top of any infestation they may have caught. To ensure all head lice AND nits are effectively targeted, it is important to complete all three treatments. The second and third treatments ensure that any eggs that had not hatched before the first treatment, or those that survived are destroyed. If you hear of a case of head lice in your child’s class or school, help get them protected PRONTO by using MOOV Head Lice Defence Spray. You have got this! It really is a very simple process, and much easier than you might be expecting. Best of luck! 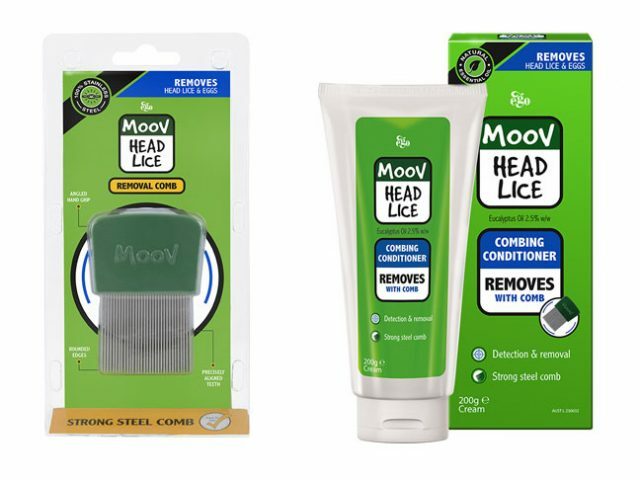 Check out the MOOV Head Lice range of treatment and preventative options here.